My hanging basket this year is purple. Purple is the color of passion, romance and sensitivity. It is also used to symbolize wisdom, magic and mystery. 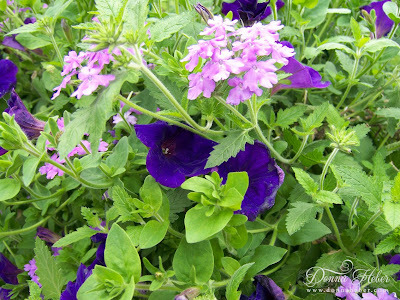 I have mixed Supertunia (Petunia) "Royal Velvet" and Superbena (Verbena) "Large Lilac Blue". These hybrids have a showy display of blooms. The petunias are a striking purple-blue and the verbenas produce lilac-blue flowers. I think these colors compliment each other. Let's hope I can keep it looking this good all summer long! How beautiful! I love the Supertunia's! We used yellow Supertunia's for our flower baskets! it's looking beautiful donna, love the color combination. 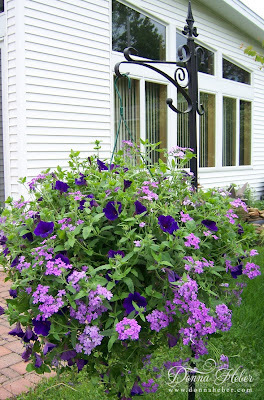 I too had some years petunias in a hanging basket and they were pure joy the whole summer. This year I have a small pink kind of them and they are just lovely, too! Hope you will have much fun with your beautiful petunias, the colours are beautiful and so is your blog. Great pictures! I enjoyed my visit here! Have a great day. Since purple is my favorite color, I just love this beautiful hanging basket! I feel so happy, I am your # 100 follower. Love your petunias. I am looking forward to reading your previous blogs as well. Oh, Donna, this is just beautiful!! Purple is my all time favorite color!! I have mostly purple flowers on my deck. This basket is just gorgeous!! Yesterdays post was awesome!! I want some of that watermelon and tea!!! Your blog is always so fantastic!! Donna, here's a hug from me. I was just reading the thread on SCS re: followers and I read your valuable input to the discussion.Then I came to your blog. Wow!! Now I know why I feel so connected to you. Tea cups, tea parties, gorgeous gardens tended by you, stampscapes and awesome paper crafting. Get ready for my visit to your home as soon as I put on my best walking shoes (ha ha). Thank you for being my follower. What an absolutely beautiful basket. I imagine you'll see some hummingbirds buzzing around it.